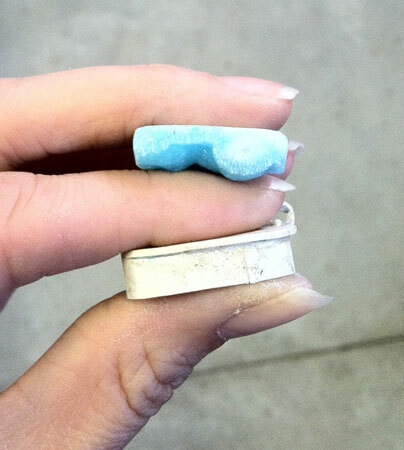 Custom design, bespoke jewelry, whatever you want to call it- it’s just plain fun. A customer comes to me and says, “I really want a unique piece tailored to my exact specifications. Can you Do that?” To which I always say, but of course. 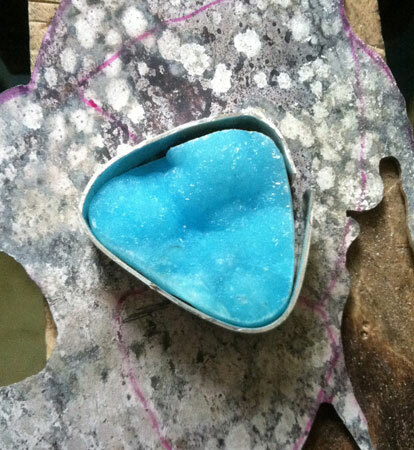 This time my lovely visionary customer brought me three stones- Druzy stones in the most stunning shade of aqua you have ever seen. She wanted them designed for a trio of her friends who had helped her in her life. To that end, she wanted anam cara inscribed on the reverse of each pendant which is Celtic for “soul friend”. 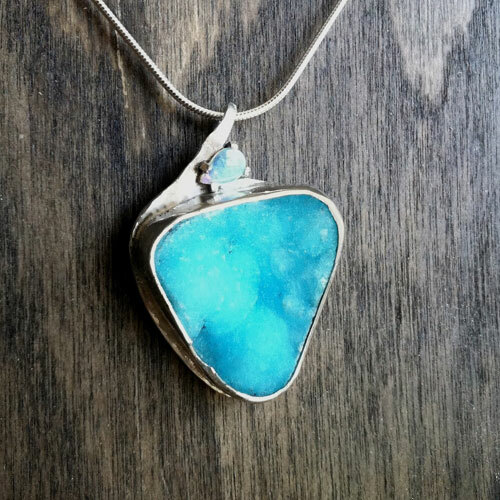 She also wanted each pendant designed for her three very different friends’ personalities. Without further ado, here’s the construction of “Elegance”. 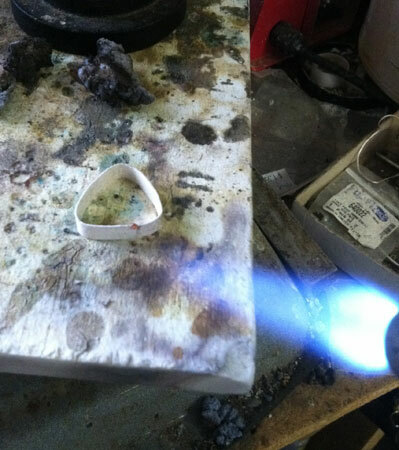 Checking how much silver I need for the backplate. Checking how much bezel I need for the sides. Checking the fit of the bezel. The gaps are alright at this point, because the stone’s sidewalls are going to need fiddling with to set it properly, and I’ll need just a hair of extra room. Double checking the backplate measurement again. 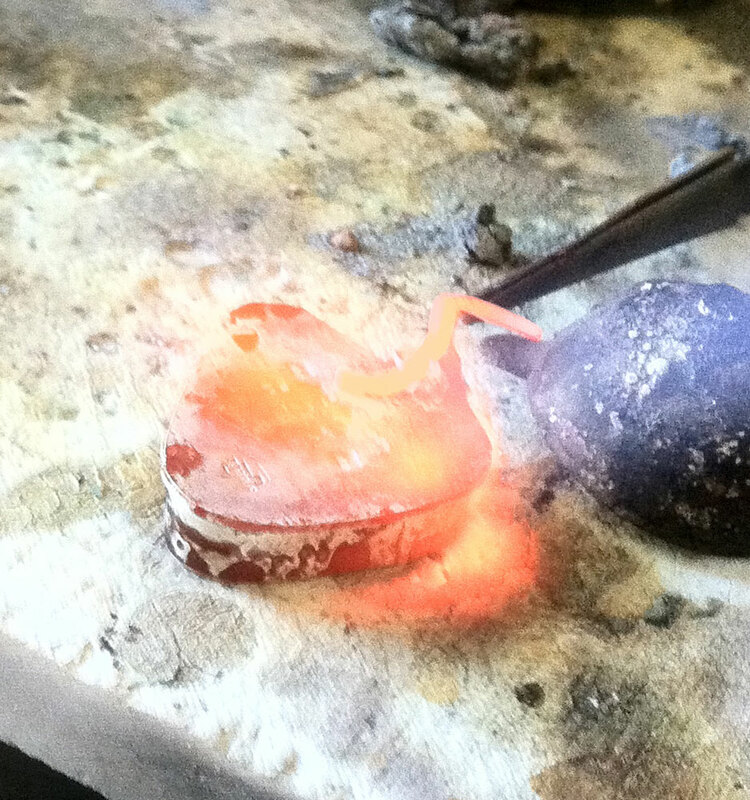 Soldering bezel to stamped backplate after cutting it to size. 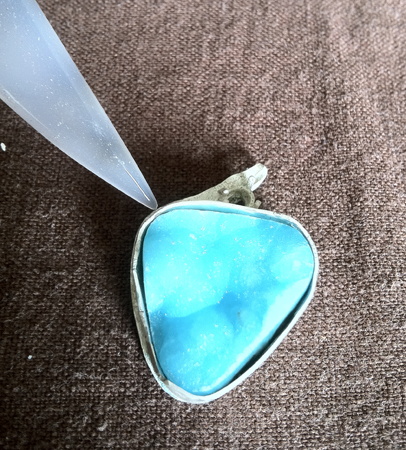 Now I also need to solder on the setting for the accent opal, and the loop that holds the chain (called a bail). I always make my backplates just a little bigger than the bezel, so I can make sure I can file the seam flush and if the bezel slips a little there’s no gapping. 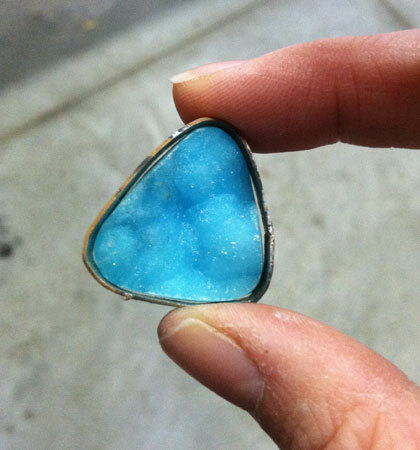 Now because the druzy is very organic and irregular around the edges, I’ll need to remove part of the bezel wall. 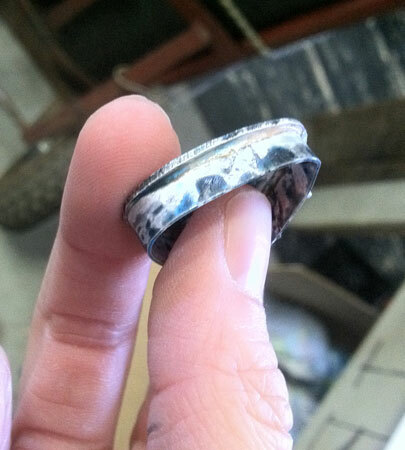 I’ll be using rotary abrasive disc tools, and need to make sure I’m careful. 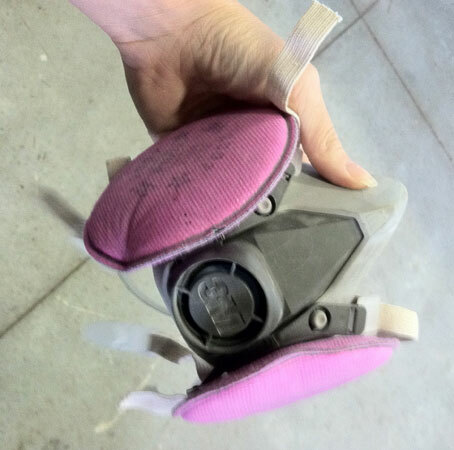 So I add my particulate mask to my safety glasses. Very important to be careful for this stuff. Which means you also get a picture of my mask, not me polishing. 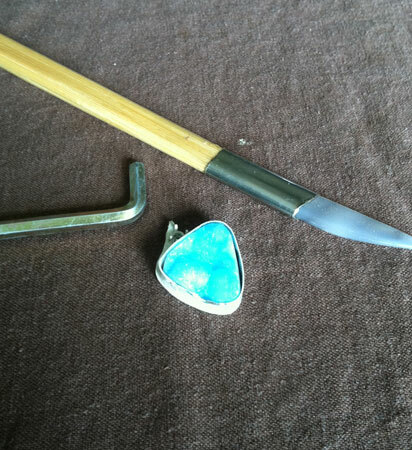 Pendant in progress and my bezel setting tools. 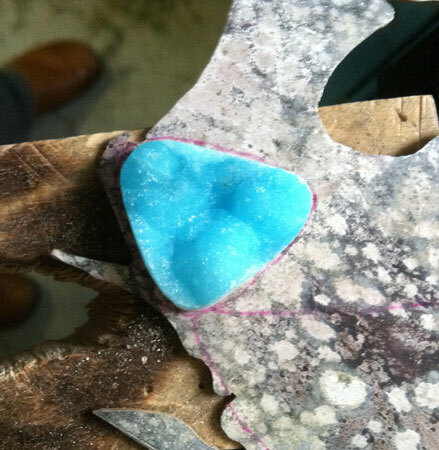 Here’s where I start stuffing the stone into the bezel. It looks like tons of room, right? Nope.There’s just room at the top, not at the bottom. Yes, I’m using an Allen Wrench. It fits perfectly into my palm, won’t distort, and has a bit of “grab” on the end because it’s not perfectly flat. So it won’t slip and scratch the stone or my hand. 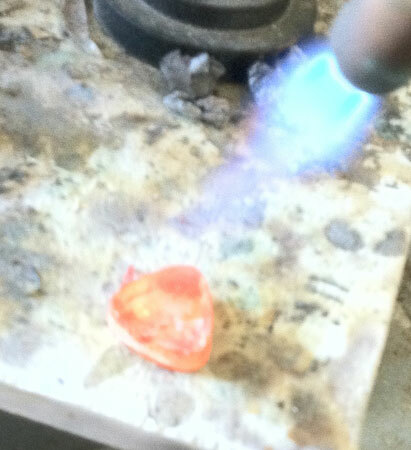 The other one is an agate burnisher for later. After working a while, you can see here where I’ve got the corners pretty much in place. I always worry about the corners or the smallest radius of the bezel first. 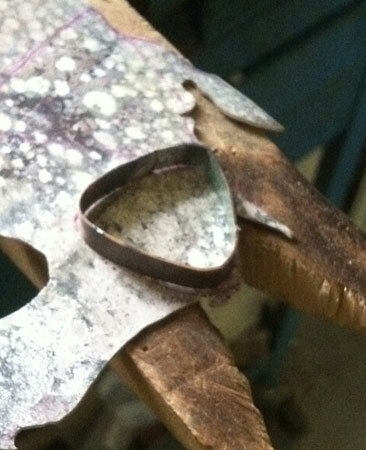 The metal needs to compress most in these areas, and less on the flatter sides. My bezel walls are nice and thick for security, so it’s very important I get the corners set before they become much thicker. 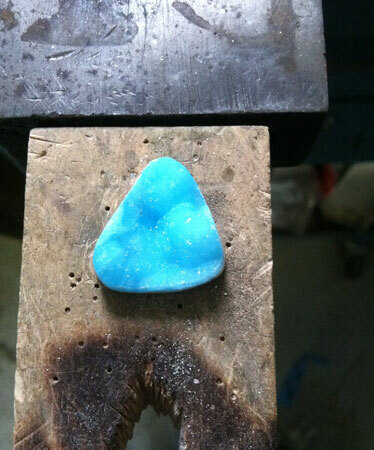 Sometimes I actually use a hammer to set the corners because the metal does get so thick- but not with druzy. Getting closer…All done! Well, except for the opal. 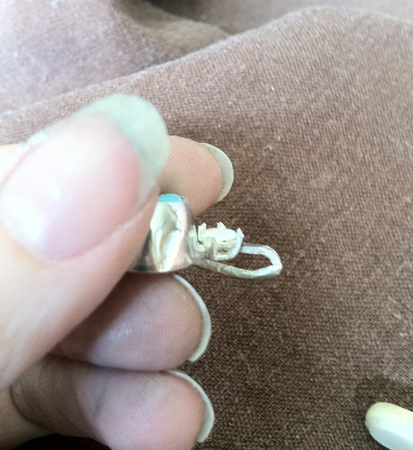 So I decided to prong set the opal, and shortened the prongs, half set them, and angled them with an itty bitty file. 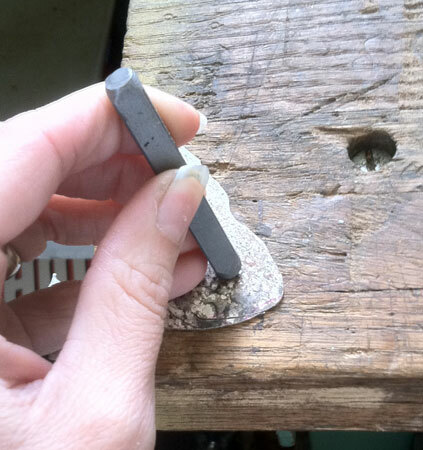 So now we have fully set prongs, fully set stone…. 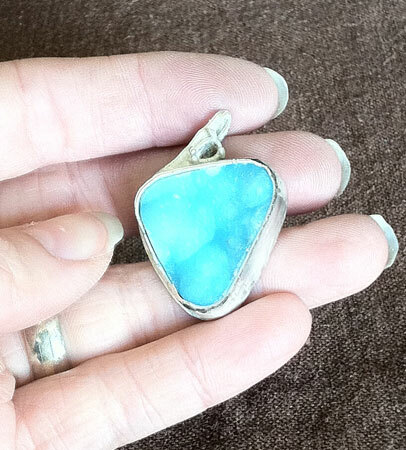 ….and final polished pendant on a chain! Tada!